MOAA is there for officers at every stage of their lives–fighting for younger officers on issues like pay raises and easing deployment stress, helping second career officers find their next position (TOPS), providing scholarships to families to help with college costs, and protecting earned retirement benefits. See our “Why MOAA” video below to learn more! 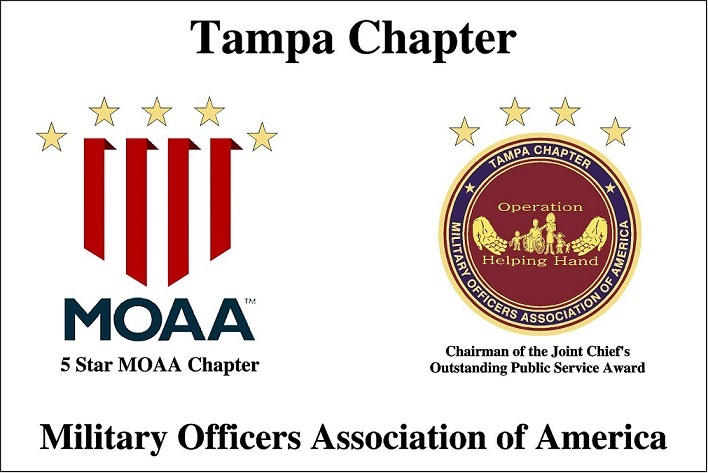 The TAMPA CHAPTER-MOAA, one of the largest and recognized as one of the top chapters in the Nation, has a very basic and focused approach for all officers on Active duty, Reserve, National Guard, and retired officers–WE’VE GOT YOUR BACK! MOAA is the largest, most effective organization advocating for officers and their families. We have over 376,000 members and when MOAA LEADERS TALK TO CONGRESS–THEY LISTEN! Without MOAA, many of the SBP–would never have happened. We need every officer on board to stay effective–WE’VE GOT YOUR BACK!